The season saw a large shuffling of the pecking order with McLaren-Mercedes emerging as the quickest constructor. Häkkinen built up a clear championship lead, but a strong mid-season resurgence from Michael Schumacher and Ferrari saw him score a hat-trick of wins, and further wins in Hungary and Italy put the two title contenders on equal points going into the penultimate round at the Nürburgring. Schumacher took pole and appeared to control the race in the early phase, but Häkkinen ultimately showed superior race pace and won. With Häkkinen having the favoured position before the final round, Schumacher had to have a car between himself and Häkkinen in the finale. Schumacher took pole, but then stalled on the grid. He fought back relentlessly from the back of the pack, but running third he suffered a puncture and Häkkinen was champion even before the chequered flag – which he took for his eighth win of the season. Ferrari nevertheless had a strong season, highlighted by its first 1–2 finish since 1990 being recorded in France, with Eddie Irvine holding off Häkkinen to finish second behind Schumacher. Irvine finished some way behind McLaren's second driver David Coulthard in the final standings, but the Constructors' Championship race remained open until the final round. With the factory withdrawal of Renault and the departure of designer Adrian Newey to McLaren, the unusually red-liveried Williams team had a difficult and ultimately winless championship defence along with reigning Drivers' Champion Jacques Villeneuve. Williams held on to third in the Constructors' race but suffered its first winless season since 1988 and the first time for eight years since 1990 without a run for the title. This was the same for 1999, but they did get a podium in Canada. Benetton also had a troubled winless season, in which young driver Giancarlo Fisichella still starred with a pole position and a couple of podiums. Jordan were without points after half of the season and looked set for a disappointing season, but a strong resurgence saw the team take advantage of the chaos in the rain-struck Belgian Grand Prix, with Damon Hill leading teammate Ralf Schumacher for a remarkable 1–2. The season also saw the final race for former champion team Tyrrell, with patron Ken Tyrrell selling the team to British American Tobacco. Tyrrell finished on a low, not scoring a single point the entire season. At the end of 1997, Renault withdrew as a direct engine supplier from Formula One. As a result, the two teams running Renault engines were forced to source alternative suppliers. Williams opted to run engines supplied by Mecachrome, who were working with Renault to develop the most recent iteration of their RS9 engine rebadged with the Mecachrome name. Benetton sourced a similar rebadged Renault engine from Playlife. Neither Williams nor Benetton were competitive to the same level as in previous seasons. Renault themselves would invest in Benetton for 2000, before buying the team outright in 2002. They would not supply engines to other competing teams again until 2007. The Prost and Jordan teams swapped their engine suppliers from 1997: Prost now used Peugeot, whilst Jordan used Mugen-Honda. The 1998 season brought about two significant technical changes to reduce cornering speeds and aid overtaking. The first was the reduction of the cars' track, from 2 m (6.6 ft) to 1.8 m (5.9 ft), making them much narrower than in 1997; a previous reduction in track occurred in 1993, when the cars were reduced from 2.15 m (7.1 ft) to 2 m. The second change was the introduction of grooved tyres to replace slicks: the front tyres had three grooves, with four on the rear tyres. Grooved tyres would remain in Formula One until the reintroduction of slicks in 2009. For 1998, both McLaren and Benetton switched from Goodyear to Bridgestone tyres, as the Japanese manufacturer expanded to work with six of the eleven teams in their second year competing in the sport. This would result in the two teams who became principal championship protagonists working with different tyre manufacturers. The two top teams from 1997, Williams and Ferrari, opted to retain Goodyear tyres. The "I"-shaped cameras mounted on top of the engine covers, seen on selected cars from 1995 to 1997, were made mandatory for each car in 1998, and changed to a more aerodynamic "T"-shaped camera; this design has remained largely unchanged since. "X wings", a pair of tall aerodynamic appendages mounted at the front of each sidepod and first seen on the Tyrrell 025 in 1997, were banned before the Spanish Grand Prix. The teams that used them in 1998 were Ferrari, Jordan, Prost, Sauber, and Tyrrell. Gerhard Berger retired at the end of 1997 after fourteen years in F1, leaving a vacant seat at Benetton. The team also opted not to renew Jean Alesi's contract, so the Frenchman signed a two-year deal to join Johnny Herbert at Sauber. As their replacements, Benetton signed Giancarlo Fisichella from Jordan, and Alexander Wurz, who had substituted for Berger for three races in 1997 when his fellow Austrian was ill.
Jordan replaced Fisichella by signing 1996 World Champion Damon Hill from Arrows to partner Ralf Schumacher. To fill his seat, Arrows secured the services of Tyrrell's Mika Salo alongside Pedro Diniz. Tyrrell also parted ways with Jos Verstappen in the off-season, despite Ken Tyrrell wanting him to stay. However, new owners British American Tobacco preferred to hire Brazilian Ricardo Rosset, who had briefly raced for the now-defunct Lola team in 1997. They promoted test driver Toranosuke Takagi to fill the second seat. Verstappen returned to F1 midway through 1998 with Stewart, while Lola's other driver, Vincenzo Sospiri, instead found a home in the IndyCar Series. Prost retained Olivier Panis, but dropped second driver Shinji Nakano and replaced him with Jarno Trulli. Trulli had started 1997 with Minardi but then substituted for Panis when he broke his leg at the Canadian Grand Prix. Meanwhile, Nakano joined Trulli's old team, Minardi, to replace his retiring countryman Ukyo Katayama. He was partnered by rookie Esteban Tuero, who was promoted from a testing role as he was preferred to the outgoing Tarso Marques. Marques would eventually return to F1 in 2001, also with Minardi. Williams (Jacques Villeneuve and Heinz-Harald Frentzen), Ferrari (Michael Schumacher and Eddie Irvine), McLaren (David Coulthard and Mika Häkkinen) and Stewart (Rubens Barrichello and Jan Magnussen) all retained their 1997 driver line-ups. The only mid-season change was at Stewart. Jan Magnussen was dropped after the Canadian Grand Prix following a series of underwhelming performances (including crashing into and eliminating his teammate Rubens Barrichello on lap 1 at Imola) and replaced by Jos Verstappen, who had been out of a drive since leaving Tyrrell at the end of 1997. When the season commenced, it was immediately clear that McLaren had adapted to the new rule changes best, with their drivers locking out the front row of the grid at the opening race of the season in Australia, both more than half a second clear of 1994–95 world champion Michael Schumacher's Ferrari. Mika Häkkinen went on to take victory in controversial circumstances after teammate David Coulthard moved over to allow him to pass in the closing laps, honouring a gentlemen's agreement that the driver leading at the first corner would win the race. Coulthard went on to finish second. This result was repeated in Brazil, although once again controversy was not far away, this time off the track: a protest was raised about a controversial braking system on the McLaren which was suggested to allow the drivers to brake front and rear wheels independently, contravening the rules. McLaren agreed not to run the system, but remained dominant in the race. 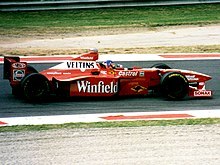 With Goodyear making steps forward before Argentina, Schumacher was able to take his first win of the season, with teammate Eddie Irvine in third. Häkkinen finished a distant second, but Coulthard only managed sixth after he was tipped into a spin early in the race by Schumacher. Coulthard bounced back in Imola by gaining pole position and winning the race, which would be his lone win of the season, ahead of Schumacher and Irvine. Häkkinen suffered his first retirement of the season due to a gearbox failure. The progress made by Goodyear enabled Ferrari to excel on these twisty circuits. In Spain, however, the fast corners favoured McLaren and again they raced away to another 1–2 finish led by Häkkinen. A further win for Häkkinen in Monaco gave him a seventeen-point lead over Coulthard with Schumacher a further five points behind. Schumacher fought back to win the next three races, while mistakes and mechanical failures cost both Häkkinen and Coulthard points. After the British Grand Prix, Schumacher had closed the gap to Häkkinen to just two points, while Coulthard was 26 points behind his teammate and looking unlikely to be able to fight for the championship. Consecutive wins in Austria and Germany for Häkkinen proved that McLaren still had the strongest car, but a strategic master stroke in Hungary allowed Schumacher to take the win (with Häkkinen only managing sixth) and close the championship gap to just seven points. The start of a typically rain-filled Belgian Grand Prix saw one of the worst accidents in Formula One history, with over half the cars on the grid crashing into each other after the first corner; four of those drivers were unable to take the restart almost an hour later due to lack of spare cars. An action-packed race saw Häkkinen spin out into retirement at the restart after colliding with the Sauber of Johnny Herbert. This allowed Schumacher to lead comfortably before crashing into Coulthard when trying to lap his McLaren. The path was then clear for 1996 world champion Damon Hill to take Jordan's first ever win, followed by teammate Ralf Schumacher in second. 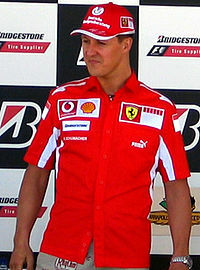 Michael Schumacher bounced back to take a surprise victory in Italy, having initially outraced Häkkinen, who ended up finishing only fourth after brake problems sent him into two spins. The championship was now level with two races to go, with the result also bringing Ferrari back into contention for the Constructors' World Championship, being just ten points behind. For the next race in Luxembourg, Häkkinen managed to beat Schumacher in a straight fight. The season concluded in Japan, where Häkkinen won easily without any challenge from Schumacher, who stalled on the grid and retired from a blown tyre later in the race. 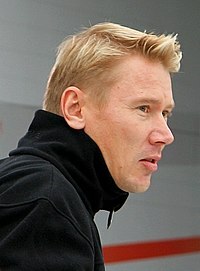 This gave Häkkinen his first world championship and McLaren their eighth Constructors' Championship. Williams, 1997 Constructors' Champion, had a disappointing season overall, with only two podium finishes for reigning Drivers' Champion Jacques Villeneuve and one for Heinz-Harald Frentzen. However, in Japan they managed to secure third in the Constructors' Championship, ahead of Jordan and Benetton. Championship points were awarded on a 10–6–4–3–2–1 basis for the first six places at each event. ^ "FIA Formula One World Championship 1998/Championship standings". ESPN. Retrieved 23 January 2016. ^ "Formula 1 Technical Regulation changes for 1998". grandprix.com. Archived from the original on 4 February 2015. Retrieved 20 October 2014. ^ "Inside F1, Understanding the Sport: Tyres". formula1.com. Archived from the original on 5 January 2012. Retrieved 23 January 2016. ^ "X Wings are banned!" 4 May 1998. Retrieved 22 October 2017. ^ a b "1998 Formula One World Championship Sporting Regulations". FIA. Archived from the original on 27 April 1999. Retrieved 23 January 2016.